On a Saturday afternoon visit to Syracuse mega shopping, dining and entertainment complex Destiny USA, my dear wife Karen and I shot a glance down past the rail as we walked on level two toward nowhere in particular. There was quite a hub-bub down on the floor of what mall organizers have dubbed The Canyon. So we stopped to figure out just what was up as folks milled about this way and that amid shiny workout equipment lined up in a row. The Cause: Cystic Fibrosis Foundation. Karen caught sight of the reason for the buzz of a winter’s day. The new wing was site for Row in the Snow, said a sign. 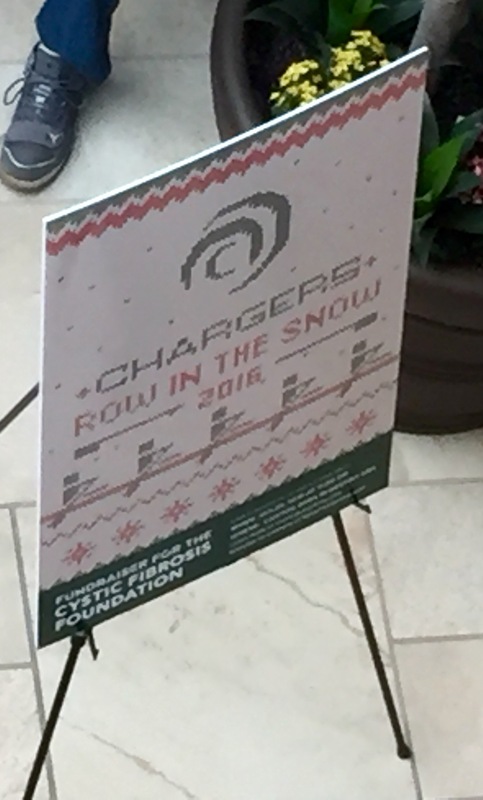 A longtime Syracuse athletic group, The Chargers, were running the fund-raiser for The Cystic Fibrosis Foundation. Those were rowing machines, we discovered. Contestants get ready to race. 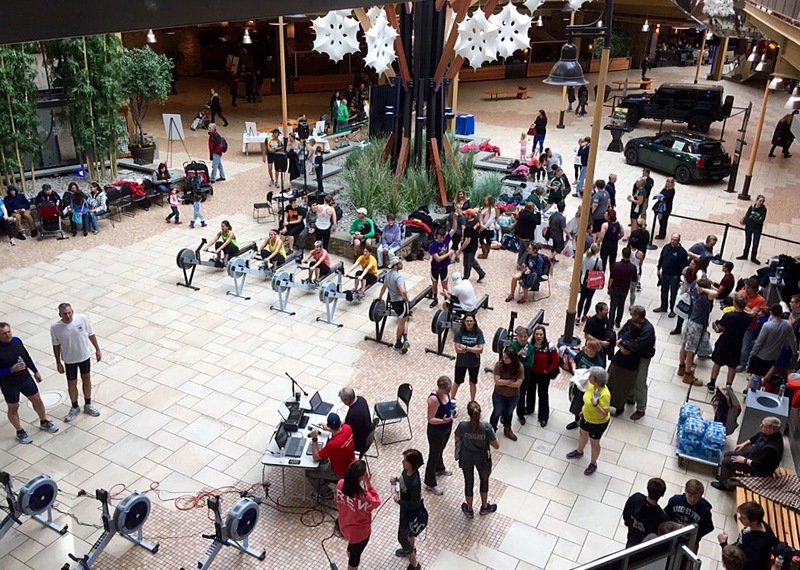 They called competitors to a slot of rowing machines for a heat in one of the categories, I discerned from the man on the microphone and a slide that was projected on a very big screen on one side of the Canyon. Yes, one of the rowers was dressed in a Santa outfit. He was not a rotund Saint Nick, perhaps from passing out all those presents one month past, or a regimen of rowing to prepare for this day. In either case, Karen and I stayed to watch the race from above, and I decided to shoot a short video from above, zooming in with my iPhone 6. Here’s the finish, including Skinny Santa apparently pulling out to victory in the middle of the line. If you’ve ever rowed, on the water or in the gym, what do you think of the experience? If you’ve done both, do you prefer the boat or the gym, and why? Would you sign up for a race in a public place like this, and why or why not? No matter the month, it seems, Benson. Perfect cheer, CM. Love it! Talk about after-holiday energy, Gatorette! Interesting! I can’t remember if I’ve ever used on of those machines but definitely have not rowed on the water. I don’t think I would participate though. Too afraid of embarrassing myself for any number of reasons. I would rather just hand over a little cash myself, Marissa. Yes, I was glad to have stumbled upon it, ZP, and it was for a great cause, too. Haha! Santa was really getting after it! Yes, PJ, Santa was flying without any reindeer! Yes, a bum elbow would make it near impossible, Lisa. Ouch!